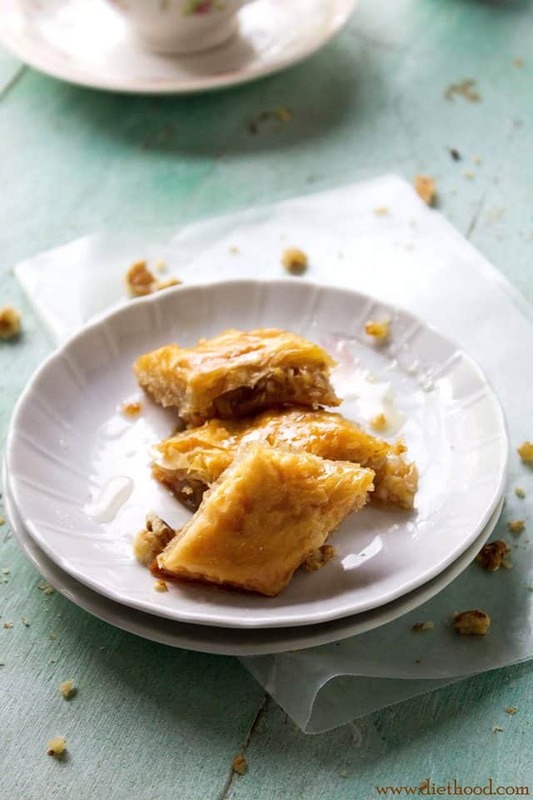 Coconut Baklava – Layers of fillo sheets filled with an incredibly delicious honey mixture with shredded coconut and walnuts. Bust out the Phyllo sheets, my friends! I’ve got a project for you! You are going to make Coconut Baklava this weekend! I can’t even begin to count how many emails I have received from my fellow countrymen/women about a recipe for Baklava. Sure, they can go to Google and ask him, but that’s no fun! You want to go straight to the horse’s, or in this case, blogger’s mouth and hear it from the expert. buahahhaha I just called me an expert! Far from it! BUT! I do make a killer Baklava, so that’s that. This amazing, sweet, crunchy dessert has been claimed by many and all; Turks, Greeks, Persians, Armenians, Macedonians… the list goes on. The truth is, we all make it, but we all also have our own ways of making it. The only standard is the Phyllo sheets. Baklava is just that; a stack of phyllo sheets filled with whatever the heck you want and drowned in a delicious simple syrup. Macedonian Baklava is usually filled with just walnuts, but I am not a fan of the whole honey and nuts filling; I need more. So I added shredded coconut. That was a smart move. No. It was brilliant!! The result is pure, sweet, coconutty goodness. Layers of Phyllo sheets filled with a mixture of shredded coconut and walnuts. Combine coconut, walnuts, vanilla, milk, and honey in a bowl, mix well and set aside. Lightly grease a jellyroll pan. Layer 10 pieces of Phyllo sheets, brushing each sheet with the melted butter before adding the next. Sprinkle the entire coconut mixture over the dough. Layer the remaining 10 sheets, brushing each sheet with butter before adding the next. Cut the baklava. You can cut the baklava into a diamond pattern, like I did, or squares. Combine water and sugar in a saucepan and bring to a boil; lower heat to a simmer, and continue to cook for 15 minutes. Pour the hot syrup over the completely cooled baklava. Let stand, uncovered, for 6 hours or overnight. Ohh I can’t wait to make this!!! What a great idea with the coconut. I’m making this for mother’s day tomorrow. amazing recipe, thank u so much for sharing !!! You had me at Coconut but then you followed with baklava! Be still my heart! THIS will be for Valentine’s Day! Is it okay if I line my sheet pan with parchment paper? Thanks. I never ate coconut baklava, definitely I’ll make this soon. I don’t like many food blogs, but I do enjoy 2 of them. I really like yours and “Cooking With Mr. C.” on Facebook. Between the two of you, I get so many ideas. Hi Dale! Thanks SO Much for your kind words!! Milk and honey in the stuffing of Baklava is a global prototype. It’s to much to even call that baklava. Almonds, walnuts, green pistachios are only acceptable – the rest are just inventions. 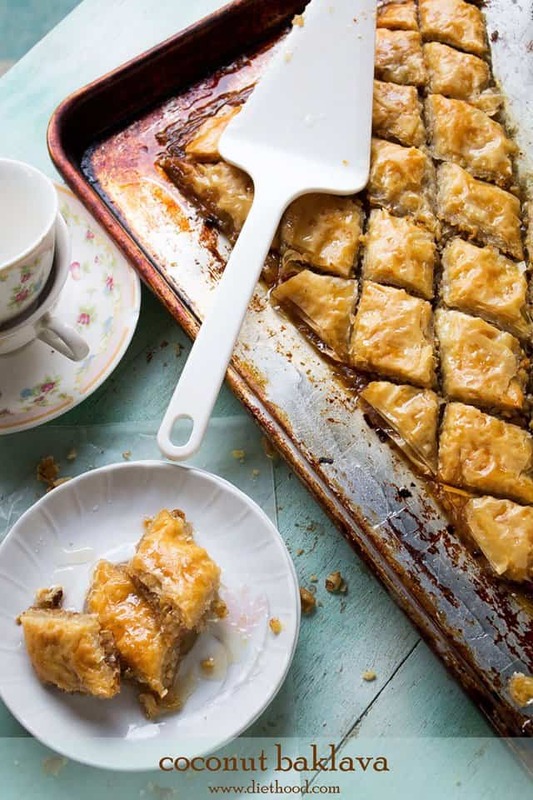 As for th syrup does not include honey in Greek versions and the most accomplished sweet – maker in Greece (and the great masters of baklava in turkey) use hot over hot so the sheet can absorb it and steel remain crunchy. That must be the torturous waiting of 6 hours, especially when the bakhlava looks this good!! I am a big fan of bakhlava, and your idea of adding coconut is genius. I’m a big fan of baklava and my family used to buy sheets of it from a Middle Eastern bakery outside Detroit. Since I’ve moved away from the area now is the time to try homemade, and coconut does sound like a brilliant addition! Your baklava looks amazing! 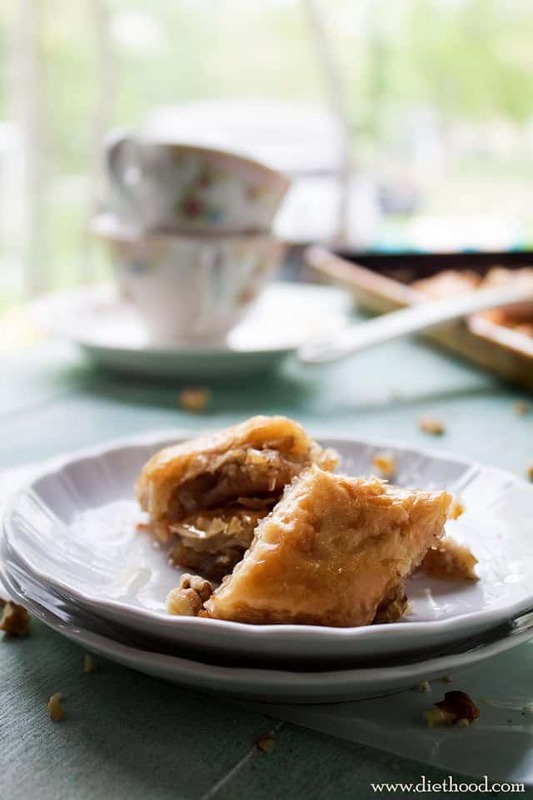 I love baklava, but have never tried making it myself – thank you so much for the recipe! HI! Yes, absolutely! Pistachios go great with baklava. In fact, you can use any nut you want, but it will alter the taste. This is a complete stroke of genius. My favorite coconut that I associate with my Indian self to the Mediterranean/Middle Eastern Baklava. How brilliant. BTW the 1st & last pics, OMG. The syrup made the baklava too sweet. I pried myself on making the best baklava but when I saw your addition of coconut, I knew it would be an ingredient I would try. I can’t wait to make this! Love baklava! Homemade is definitely on my to do list. So glad I saw this before I tried it. Coconut sounds fabulous! I adore baklava, and adding coconut was sheer brilliance!!! Kate, you have outdone yourself again! This looks sensational!!! Pinning! This baklava rocks! I´ll add it to my soon to-do projects. I´ve been meaning to make one, and coconut sounds so much more interesting. You macedonians have so many great recipes! I’ve never heard of using milk and honey in the filling though some syrups DO use honey and cardamom as well as the lemon juice. You learn something new every day,I guess. Your inspired addition of coconut sounds divine. I’d be delighted to eat this, it looks just delicious. I love the angle you chose for the last photo–very nice! Come to mama!! Kate, this baklava looks amazing!! Pinned! Holy heaven on earth!!! 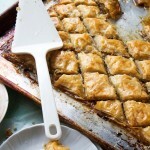 This baklava is outrageously amazing… I need. I have attempted once to make Baklava and I love it! Your baklava definitely looks killer. Love the coconut! You rock, my friend. This is one of my most favorite desserts. And, I might add, I make a killer version as well. I’m guessing it’s because we learned to as babes, eh? I’ve been told that Greek baklava is different than other countries versions because they use honey, not the simple syrup. I like our way better. The lemon juice really adds. My mom also taught me that you can pour hot syrup on cold baklava or cold syrup on hot baklava, but if they were both the same temperature, the baklava would get soggy. You hear that too?